Hello, y’all! I hope you were excited about our last holiday side dish, my famous Mashed Sweet Potatoes with Coconut Milk, Bacon, and Cilantro. This time I am going to be sharing with you Mac and Cheese Carbonara, a recipe adapted from Chef Bobby Flay. I though this mac and cheese might be a great side dish to add to either our Thanksgiving or Christmas table — or as an everyday main dish as well. Chef Bobby Flay’s Mac and Cheese Carbonara is a scrumptious variation on the traditional mac and cheese. Of course, there is nothing wrong with the traditional mac and cheese, but having something familiar on our plates with a new flavor can be exciting, don’t you think? In case you didn’t know, the term Carbonara applies to an Italian pasta dish from Rome that was created in the middle of the 20th century, and is based on eggs, cheese (Pecorino Romano or Parmigiano-Reggiano), bacon or pancetta, and black pepper. Although spaghetti is the customary pasta used, we will be using elbow macaroni to compose our mac and cheese carbonara… A real fusion between American and Italian cuisine!! I hope that you enjoy our creamy mac and cheese as much as my family and I did. This creamy and delicious mac and cheese can be either served as a main or side dish. 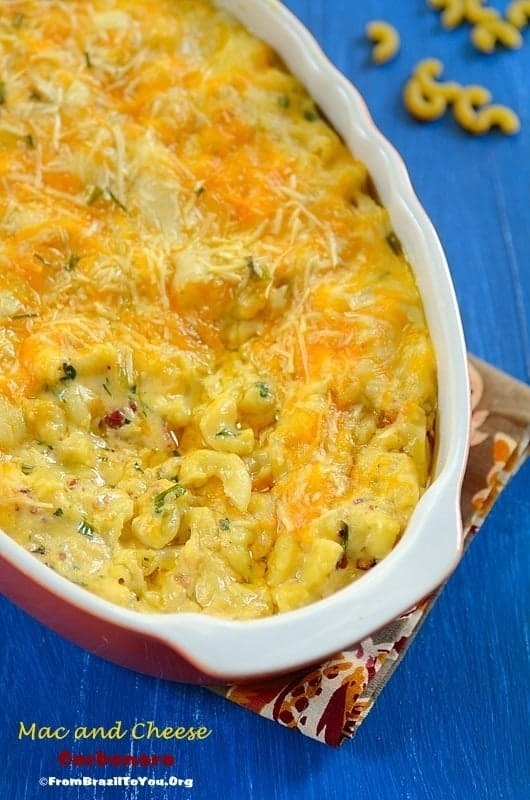 It is an exciting variation on the traditional mac and cheese!!! Preheat oven to 350 degrees F (about 177 degrees C). Grease the bottom and sides of a 3-quart baking dish with butter and set aside. In a large saute pan, heat the olive oil over medium heat. Add the diced bacon and cook until golden brown. Remove with a slotted spoon to a plate lined with paper towels. Add the garlic to the pan and cook until lightly golden brown. Whisk in the flour and cook for 1-2 minutes. Next, whisk in 6 cups of the hot milk, increase the heat to high, and cook, whisking constantly until thickened, for 3-5 minutes. Whisk in the light beaten egg yolks until incorporated and let cook for 1- 2 minutes, stirring constantly. Remove from heat and whisk in the chopped chives, cayenne, and all of the cheese until completely melted. Season with salt and pepper. If the mixture appears too thick, add some of the remaining milk 1/4 cup at a time. Mix in the cooked macaroni, reserved bacon and chopped parsley, and stir until combined. Transfer the mixture to the prepared pan. Combine together additional Asiago, Cheddars, Mozzarella, and Parmigiano cheeses in a bowl and sprinkle evenly over the top of the macaroni. Bake in the oven until heated through and the top is lightly golden brown (about 12-15 minutes). Remove from the oven and let rest 10 minutes before serving. To visit its original source, please click here. 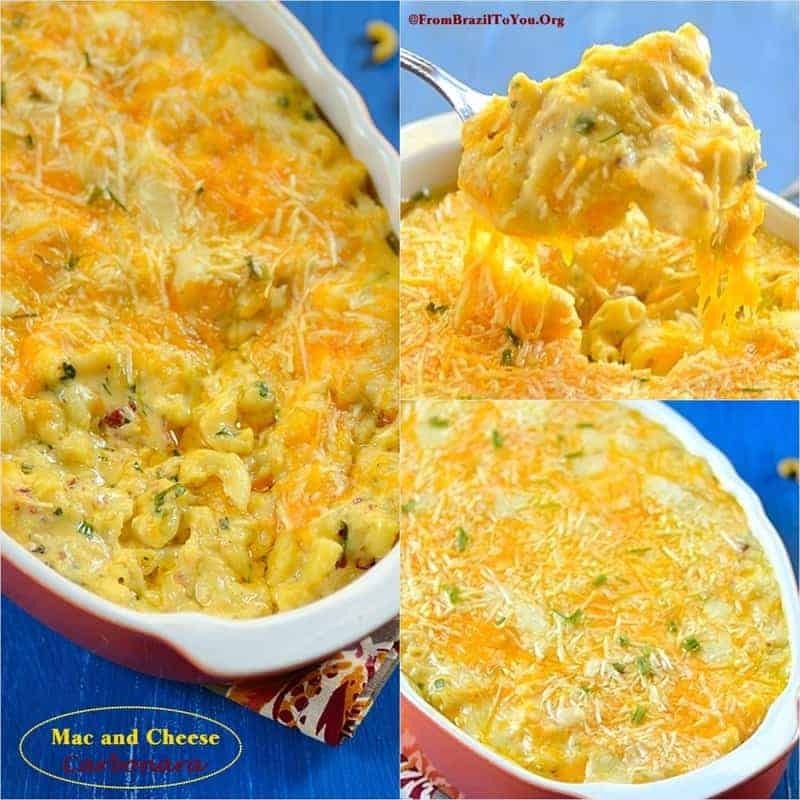 Looks so rich and creamy….Our family loves mac and cheese… I love this fusion dish…I will try this out soon! wow, i can smells the cheezy goodies when you pop it out from the oven……..
Oh Wow! This looks stunning Denise! I could pin this a 100 times. And two of my favourites..mac and cheese and carbonara! You are amazing! Deeee-licious! Great casserole Denise! Thank you! Thank you for stopping by, Little Cooking Tips! I could most definitely make a meal out of this, wow. what a combination!!! 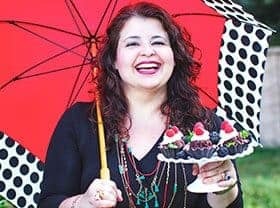 Traduzi a receita no tradutor do google Denise, mas realmente percebi que alguns nomes de queijos são desconhecidos para nós no Brasil. Mas vou encontrar outras receitas deliciosas que certamente poderei fazer. Lindos pratos, ver isso na hora do almoço e não poder experimentá-los é judiação, kkk. Parabéns. kkkk Sinto muito, Ana querida! Quisera eu que os ingredientes estivessem disponíveis aí no Brasil. Mac and Cheese sempre foi um dos meus pratos americanos favoritos. Muito obrigada por sua visita. Bjs. Who knew you could make mac and cheese even better???? Your carbonara version looks incredible, Denise! Oh my goodness! This Carbonara is so luscious I want to have this for dinner instead of the holidays, that way I will have room for a second scoop! Thanks so much, my dear Deb! You are always so amazing and sweet! Jesus tap dancing Christ! Your golden mac and cheese shots almost gave me a heart attack! That dish looks like a gold mine! Thanks, Nusrat! This was one delicious dish!!! Wohoooo, girl this is out of the world crazy good looking. I agree with Nusrat, it looks like golden heaven, I reallllllly am tempted to take a dip. The pictures are pinterest gold mine, seriously looks so good. Terrific dish! I use bacon in my mac ‘n cheese sometime, but have never gone whole carbonara treatment. Love the idea! So good – thanks. Thanks, John! This recipe from Chef Bobby Flay is terrific! Oh my! Your Mac and Cheese Carbonara looks so decadent and absolutely my kind of comfort food! Oh yes lots of cheese I am going to have that on the weekend. A nice twist on the traditional Denise! Looks really good! Thanks, Nazneen! Chef Bobby Flay did a great job on this recipe. Me too, Raymund! I love both pasta and cheese. 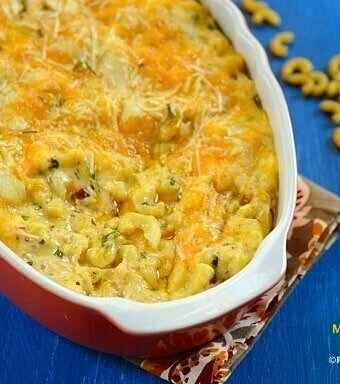 I need this mac and cheese in my belly asap! Looks amazing! Enjoy, Pamela! This is a great recipe from Chef Bobby Flay. This looks amazing but the 6 1/2 cups of cheese will have to stop me. Thanks, Nami! My family is a fan of mac and cheese as well. We had a great time eating it. It looks fabulous!!!! Such a yummy comfort food. Thanks, Jaime! It is great to have you visiting me here. This is a different Mac and Cheese since it takes double load of cheese plus bacon. My hubby and I love this dish! Enjoy!